The Cosmos as we know it, is vast and layered. Our little world sits in the center of Mundus, finite and tiny compared to the eternal spheres beyond. A mote of dust floating in the vast cosmic ocean. We mortals are bound to this plane by laws of nature, as defined by the death of the Ehinofey, the Earth Bones. This, and the Aedra, who gave of themselves to stabilize this world, govern time and decay, the winds, and gravity. These laws are the root of our mortality. And yet, though we are all bound by time, we can look up into the sky and glance at eternity, for it is there above us and beyond. Let us imagine for a moment, that we could levitate far beyond the surface of our world. What would we encounter on our journey, as we float up through the planes, the creational gradients, of the Cosmos? As we leave our planet, we enter the grey space of Mundus, and it is filled with many worlds. These worlds are the worlds of the gods and they are of the gods. They are the Aedra. Beyond Mundus, we find the great Void of Oblivion, and in it many other worlds. These are the worlds of the Daedra, and they are of the Daedra. They created worlds that are infinite and timeless, and did not give themselves over to mortality. This Void encompasses our world like a great sheet of the night, forever obscuring what lies beyond. On the edge of Oblivion, is the border between time, creation, and pure magic. It is here that we find the stars. Like great pinholes in the night, they are the holes in Oblivion that lead to Aetherius. Beyond this veil we cannot see. We can only catch a glimpse of the realm beyond through these stars. Imagine, for a moment, that we could punch through the veil, as Magnus once did. If we were to travel through our sun, through the great hole Magnus left when he departed our world, we would enter Aetherius. This is the realm of pure unfettered magic. In reality, entering this realm would probably destroy us. We would be unmade, as the great forces beyond ripped away our mortal flesh. This realm remains the great mystery. What lies beyond Aurbis? Do the gods themselves even know? It is here that our journey comes to an end, so let us return to Nirn, and reflect on all that we have seen. The story of our creation is told differently depending on who you ask, but from all accounts, some of which are recorded in the Monomyth, a few correlations can be made, and we can consider them theoretically probable. Mundus was created by the et’Ada, primarily those aligned with Anu, who came to be known as the Aedra. The Aedra created the races of men in their image, and gave parts of themselves so that this world may house us safely. The mer, on the other hand, believe they are the descendants of the Aedra – fallible and ever degrading copies of the gods as their bloodlines are muddled by mortal existence. In a way, we are all godstuff. It is perhaps the Dwemer who most exemplified the mer’s distaste of mortal existence. Though most mer stoically accept their place in the Cosmos, the Dwemer longed to return to their place in Aetherius. So they sought to “uncreate” themselves, by shedding their mortal forms to become beings of pure thought and magic. In the end they did end up “uncreating” themselves, and their race has disappeared from Nirn forever. Perhaps they succeeded, and they are now journeying through the Cosmos unbound by time. Sadly, they more likely obliterated themselves. The ambitions of the Dwemer are considered profane, and none of us seek to earn the ire of the gods as they had done, by seeking to build new gods or gain immortality. However, this does not mean we cannot benefit from their knowledge. We have too long been living in the dark, afraid to seek the same understanding. The Dwemer were the greatest astronomers of any age. They built great telescopes and Orreries, and their star charts are the most accurate to this day. Had the Dwemer not sought to uncreate themselves, what other wonders would they have accomplished? It is from ancient Dwemer writings, and my conversations with the last living dwarf, that we can come to understand the concept of creational gradients. The Dwemer believed Aetherius represented the most perfect gradient of creation, a formless gradient of pure thought and infinite active potential. From there, the creational gradients give way to formations of time and space, and the beings existing in these gradients have stronger concepts of self. We represent, perhaps, the most distilled and crystallized creational gradient. We live in a world where thought and ideas are defined. In Mundus, the interplay of Anu and Padomay, of stasis and change, are governed by the steady tick of time. We are the anchor of creation, and without Nirn the entire Cosmos could potentially spin into chaos. Our lives are a continuous cycle of life and death, and yet we exist in boundless potential. We live in a constant state of creation and destruction, and our passions and ambitions often exceed those of the gods. Nirn may be unique in the Cosmos, being the one and only home to mortal life, but it numbers amongst the eight planets of the Divines. They exist alongside our own world in Mundus. They are the Aedra, governing the laws of nature and watching over us. These planets are the gods and the planes of the gods. Each plane is infinite. Distorted by the Void of Oblivion, they appear as spheres to our mortal eyes. 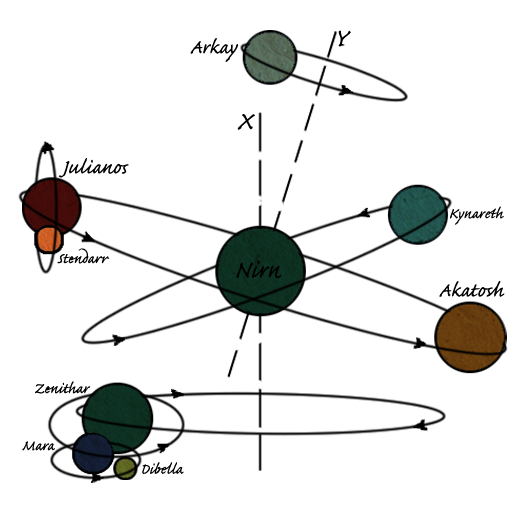 All eight planets, along with Nirn, are present in the Dwemer Orrery, and have a complex system of orbits. 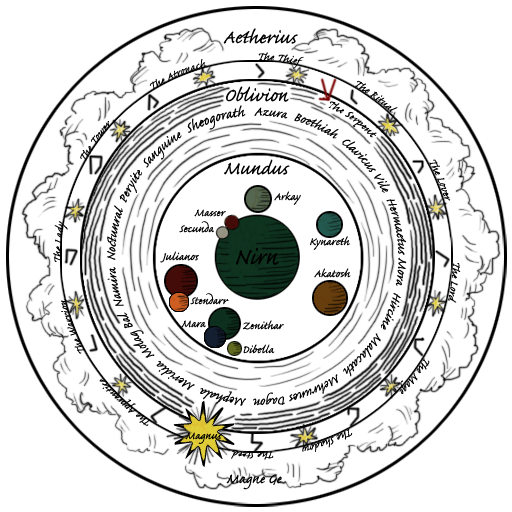 Nirn is the central planet on the Orrery, and it does not have an orbit, but rotates daily on its own axis. Because Nirn remains equidistant from the stars, which are fixed in their position in the firmament, it can be assumed that Nirn sits in the center of Mundus. It makes philosophical sense as well, as our creational gradient is the prime distillation of the interplay of Anu and Padomay. We can also assume that the positions on the Orrery are indeed correct, since the Dwemer were highly empirical in their research. Of the eight planets, three are the Dominion Planets, which govern the three Guardian Constellations. These are Akatosh, the eye of the Warrior, Julianos, the eye of the Sage, and Arkay, the eye of the Thief. These planets maintain fixed positions in relation to the constellations, and follow an annual orbital path around Nirn. 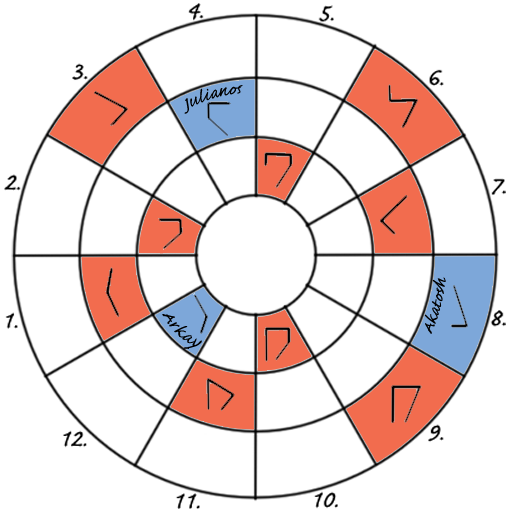 From studying the Dwemer Orrery at Stros M’Kai, we can see that the three Dominion planets correspond to their given latitudes on the Dwemer star charts. A diagram of the Dwemer Orrery shows these planets and their relative orbits at the end of this chapter. Only two other planets orbit Nirn directly. These are Zenithar and Kynareth. Of the remaining planets, is Mara and Dibella, orbiting Zenithar, while Stendarr orbits Julianos. Always prevalent in the night sky, are the two moons Masser and Secunda. These are the attendant spirits of the mortal plane, and they too are temporal and bound to the laws of mortality. They are the fragments of Lorkhan, who was divided and had his heart sent hurtling down to Nirn after the great experiment that created Mundus. Over time, they have begun to decay. To mortal eyes, they appear to fade in parts, and the back of the night sky can be seen through them. In eras to come, they may be all but a faded memory as they pass forever into the night. Now we will travel to the stars. What are the stars, and what power do they hold over our mortal realm? The stars are the pinholes to Aetherius, and the true source of all magic. They were left behind as the remaining et’Ada, the Magne Ge, escaped our plane, tearing holes in Oblivion. They are the source of all light in this world, and it would have been a dark place indeed without them, as we are encompassed by the darkness of Oblivion. Magnus, the sun, is the greatest of these tears in Oblivion. Magnus, the grand architect of Mundus, shattered the night as he tried to escape the bonds of his mortal creation. As Nirn performs its daily rotation on its own axis, Magnus appears to rise and fall, giving us the night and day. At night, Magnus is obscured, and we can see deep into Oblivion which surrounds us. During the day, Magnus casts pure magicka upon our world and lights up the sky, obscuring the Void of Oblivion. When you stare into the sun, you are staring directly into Aetherius, into the heart of magic. Magnus also appears to rise and fall as the year cycles. It reaches its apex in the noon sky during the month of Sun’s Height, and its nadir is in the month of Evening Star. Magnus, unlike the other stars, is not fixed in its position. It moves across the firmament in a regular annual pattern, and as the sun rises in each constellation, it governs the seasons. Each constellation has a season of approximately one month. We determine the month according to which constellation Magnus is currently residing in, and this also governs our Birthsigns. The constellations are collections of stars. The stars are fixed in their relative positions equidistant from Nirn. They remain fixed in their positions, in their constellations, as a form of defense from the threat of the Serpent. In theory, they could otherwise move across the firmament as freely as Magnus does. However, the entire sphere seems to follow a predictable annual rotation. They also shed a bit of magic into the fiber of our being. Every one of us has a Birthsign, depending on which constellation we are born under, and this governs specific attributes in each of us. The effects of the constellations on our mortal fiber can be found in the text The Firmament. The Guardian Constellations are each governed by a Dominion Planet. As the stars in the firmament rotate, these Dominion planet’s orbital paths follow the paths of these stars, and always remain in the same relative position to these constellations. Perhaps instead, the stars follow the path of the Dominion Planets, so the Guardian Constellations may maintain their guardianship. These constellations are the Mage, the Warrior, and the Thief, which are governed by Julianos, Akatosh, and Arkay respectively. These Guardian Constellations protect the Charges, which are constellations under their domain: the Mage protects the Apprentice, the Atronach and the Ritual; The Warrior protects the Lady, the Lord, and the Steed; and the Thief protects the Lover, the Shadow, and the Tower. So why exactly do we say the Guardian Constellations protect the Charges? It is in fact quite literal. Each constellation is in turn threatened by the thirteenth constellation, the Serpent. The stars seem to have gathered into constellations according to their magical attributes. They are echos of the Magne Ge who left them. Magnus, for example, though it is a hole in the fabric of the void, is also a literal piece of Magnus himself, and effects some of Magnus’ power on this world. The Serpent is not a true constellation, as it is not made up of stars. This constellation is made up of “unstars” of which its true nature remains a mystery. These are thought to be anti-stars, that is, they are the opposite of true stars. Instead of emitting magicka into Oblivion, they are said to “eat magic.” The Serpent moves through Oblivion and threatens the other constellations. When someone is born under the sign of the Serpent, it is because the Serpent has moved into the position of the constellation that person would otherwise be born under. The Serpent however, has equal purpose in creation. Without it, the stars would have no set patterns, and we would have no seasons. They would wander the firmament aimlessly, and their effect on our daily lives would be greatly diminished. Beyond Mundus lies the Outer Realms. Of these, we are most familiar with Oblivion, and its planes have been well documented. We can see directly into Oblivion when we look at the night sky, and the denizens of this realm are frequent visitors to ours. The Void of Oblivion was created, and is inhabited, by the Daedra. These were the Padomay aligned et’Ada who refused to take part in the creation of Mundus. Instead, they created their own realms. Each Daedric plane is a world, and that world is the Daedric Prince, just as the planets are the Aedra themselves. These worlds are ever changing, but their essential character remains, as each Daedra, much like their counterparts the Aedra, are entities of concept. These realms are inherently dangerous to mortals. We are considered small beings to the Daedra, and they derive great amusement from toying with us. They are not inherently evil. In fact, the concept of good and evil does not apply to them. Their motivations are alien to us, and only rest on the spectrum of morality according to our own perceptions. The realms of the Daedric Princes have been well documented, and there has been much literature devoted to them. They are worlds that mirror the essential character of their creators. Some are quiet and inviting, like Azura’s realm of Moonshadow, while others are dangerous worlds filled with fire or ice. They are infinite and impossible, and within these realms, the laws of nature do not apply. They are only mimicked according to the whims of the Daedric Prince who maintains it. Outside of the Daedric realms, Oblivion is a cold void, filled with the discarded remnants of past Daedric creations, slowly decaying over time because their forms are no longer maintained by an active will. The exception is the Serpent, the collection of unstars that travels across the outer edge of Oblivion, threatening the stars. The Serpent is also a Daedric creation. By whose will it was created we cannot be certain, but it seems to act with a will of its own, just as the stars seem to mimic the will of the Magne Ge who created them. Beyond Oblivion is Aetherius, and this plane remains a great mystery. We can only catch a glimpse of its glory though Magnus, which radiates the magic of Aetherius upon us daily. Aetherius is a realm of pure magic, and the source of all magic in the Cosmos. As far as we know, its state is the state of the universe at the beginning of the Dawn Era. This is the state of potential that we all came from, pure magic in its original form. However, we must remember that Aetherius did not exist before the creation of Oblivion. It was the creation of Oblivion that defines Aetherius, just as there is no black and white before it is separated from the grey. The inhabitants of Aetherius are the Magne Ge, those et’Ada who escaped the creation of Mundus along with Magnus, and broke through Oblivion to create the stars. We know nothing of them, save for perhaps Meridia, whose sphere is a great mystery. The Imperial Census of the Daedra Lords alludes that she may have been exiled from Aetherius rather than Daedric in nature. Even if this is so, there is no other contact with the Magne Ge. Those in Aetherius remain in Aetherius, and those outside of Aetherius are not allowed in. Some myths claim the souls of the Aedra reside in Aetherius. The Altmer also claim this is where their souls go when they die. I believe on both accounts that this is wishful thinking. In truth, I think the remaining et’Ada do not invite us there, and that the Aedra are exiles along with their brethren the Daedra. It is more likely that we enter the Dreamsleeve. During my travels in Morrowind, I had the opportunity to speak with both Vivec and Yagrum Bagarn, the last known living dwarf. From their telling, I have gathered that the Dreamsleeve is the aggregate consciousness of Mundus, and ultimately a delusion that forms part of our reality. It is an important delusion, and I will discuss at length in later chapters how thoughts have real power in our universe. Is has been proven time and time again that travel to the Outer Realms is indeed possible. The Daedra seem to come and go as they please, manifesting on this world and returning to their homes in Oblivion. They are of course of a higher creational gradient than we mortals, so they seem to do this with relative ease, but it is entirely possible for mortals to visit the planes of Oblivion, and we have always been capable of summoning Daedra with concentrated effort. In fact, travel to the realms of Oblivion has happened since time immemorial. 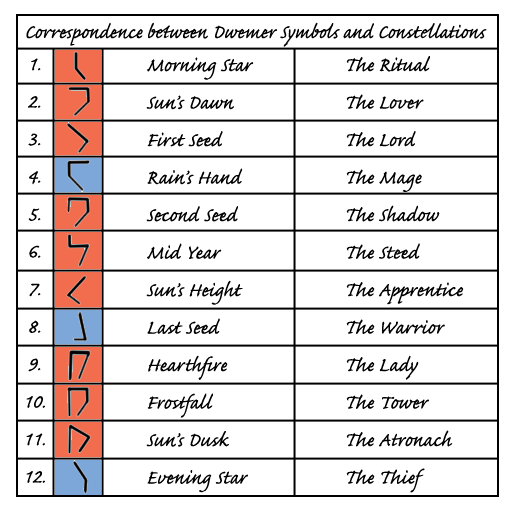 The Imperial Census of the Daedra Lords makes full account of the findings on some of these travels. We know most of the Daedric realms well indeed. Only a few of these spheres remain obscured to us. As for those we know, the Daedric Princes even invite us – or should I say dare us – to enter their realms and look upon them in fear and awe. There are accounts of mortal travel into the Outer Realms by the Dwemer. And this claim was stated outright by Yagrum Bagarn during our lengthy conversations. Their experiments with high magic and meditation allowed them to astral travel outside of Mundus. Perhaps members of the Psijic Order still know some of these methods. Where exactly they went remains a mystery to this day, but we can assume they had a good look at Mundus from the outside. They likely corroborated their mathematical calculations of the movements of the planets with exterior observation. Even more fascinating are accounts of travel to the stars in the Merethic Era. Expeditions of the Reman Dynasty and the Sun Birds of Alinor attempted to reach the stars, powered only by magicka. We know that some of them managed to return, because they acquired samples of celestial minerals that still exist in Nirn to this day, in the great Orrery of Firsthold. The cost in magicka however is extreme. Due to this great cost, few attempts had been made to travel to the stars using these methods. It begs the question: why have the majority of us turned our back on the heavens for so long? Most knowledge of the ancient mer has been obscured. We have not made significant scientific progress in this area since the disappearance of the Dwemer. Their disappearance made us fear to examine the universe we live in. The loss of scientific curiosity is a great loss to mer and mankind. We could all benefit by regaining some of the innocence of the past. We have once again begun to take our first tentative steps into the vastness of the Cosmos. The Royal Imperial Mananauts of the Elder Council are the legacy of the Sun Birds, and have made many journeys into the Outer Realms. We have boundless opportunity to conduct further explorations, and gather more of the celestial materials for further study. Perhaps we can not enter Aetherius, but we can touch the stars, and there are whole worlds in both Mundus and Oblivion to explore. We can be said to touch the Edge of Forever when we harness the raw elements of nature – the pure magic that emanates from Aetherius. We are all formed by magic, and to magic we will eventually return. Magic is the essential building block of all matter in the Cosmos. So what is matter, and what is magic? Magicka is potential energy, and this potential is released and given form through concentrated thought. Magicka can be converted into matter, and in fact this is how all matter came to be. Matter is magic given form. This can be expressed by the equation M = mC2, where M represents magicka, m represents matter, and C equals the constant of the speed of pure thought. The constant C is determined by the maximum speed that can be attained by pure thought. As thought reaches the minds of beings of lower creational gradients, the speed of thought slows down. Because of this, mortals are not inherently capable of reaching thought speeds that can convert magicka into matter or vise versa. Mortals can use magicka as potential energy, and we are capable of altering matter, but we can neither create matter nor completely obliterate it. In the creational gradient of Aetherius, or pure magic, matter can be condensed from magic and dispersed with a mere thought. The et’Ada, and by extension the beings they became, whether it be Magne Ge, Aedra, or Daedra, are fully capable of doing so. Were a mortal to approach the maximum speed of thought, our own matter would be converted into magicka, and we would quickly cease to be. Even the et’Ada could only approach the upper limit. Were they to reach the maximum speed of thought, they too would lose their sense of being and disperse into pure magicka. This supposedly happened to many of them before the dawn of time. Magicka effects matter on a continual basis. Magic is what gives us light, and were it not for the constant radiation of magic on this plane, we would see only darkness. Matter has mass, and the density of matter is what causes the effect of gravity on our planet. All matter has a gravitational pull, which draws matter and magicka together. This gravity determines the orbital paths of the planets around Nirn, and each planet in turn has its own gravitational pull. The Daedra and the Aedra are capable of manipulating magicka to a degree that is difficult for mortals to comprehend. We can only perceive its effects. For example, Akatosh manipulates the magicka of the entire Cosmos in order to create the effect of time. Theoretically, this is done by effecting constant rhythmic change on the whole of creation, and by focusing thought, a temporal stasis is imposed on each moment, which then crystallizes that moment. It becomes a single moment in time, which then gives way to the next through the same process. It is a subject of much philosophical debate, whether Akatosh still plays an active role in the creation of time segments, or if it was something he simply set in motion. In any case, its effects are self-evident. As mortals, we are only capable of effecting minimal change on the structure of the Cosmos. Alchemists are capable of drawing the magical properties out of matter, and distilling them into liquid form. This is different from the other magical arts, as it does not require concentrated thought to manipulate the potential energy of pure magicka. Other forms of magic require concentrated effort, and are powered by the intentions of the caster. Each spell is a formula – a specific pattern of thought that can be used to channel magicka to effect change on nature. Most spells we know today were formulated long ago by the ancient mer of the Merethic Era. They were wild with their magical experiments; they took greater risks than most living mortals to this day, and as a result, have given us a legacy of magical studies. Teleportation magic is perhaps the most advanced form of magical manipulation, and is one subject of magical study that has advanced the most in recent history. Teleporting is not as simple as thinking your way from one place to another, though that is what it appears to be. To displace yourself in space in this manner, you must move your entire being through a single moment in time. We mortals are not capable of stopping time, so instead we bend space around us, resulting in a stretching of time. Three dimensional space is compressed in a single moment, and it must be a single moment lest the surrounding forces are allowed to act and tear us apart. The effects of a failed teleportation spell can be disastrous. One could end up embedded in a floor, turned inside out, or completely evaporated. Most ordinary mortals are unable to perceive these extra dimensions, so we require formulated spells to perform teleportation magic. It is a rare mortal who can formulate new spells by perceiving the dimensions beyond. Beings such as the Daedra, on the other hand, are continually aware of the dimensions beyond. In fact, they partially exist beyond third dimensional space and time. It is due to this extra perception that they can move through time and space with such ease. Magic requires the focused application of thought on magicka. Without thought, magicka only exists as potential energy. The Dwemer managed to build devices that could think for themselves, so their machines could propel themselves on magicka for ages. Scholars have speculated that they were able to harness the Heart of Lorkhan to propel their machinery without concentrated effort on their part. Lorkhan, being in a sense the god of invention and ideas, maintains the essence of thought itself in his remains. So where does thought come from? It is reasonable to assume all thought originated in Sithis, and that this state of being has been gradually broken into concepts. These concepts took on on the real form of being in order to examine themselves. As each thought became concept, entities emerged, which used these concepts to create gradually smaller and more defined entities. We too are entities of thought, and equally capable of examining ourselves and the universe, though on a much smaller scale than the god-like beings that came before us. The gods themselves are the embodiments of one or more concepts, and they are each defined by that governing concept. They are limited in their thinking, as all their thought is defined by the set of central concepts they embody. They are the concepts they embody, the forces of nature themselves. Were they to choose, or be forced to embody a different concept, the nature of that god would change. This perhaps explains such myths as the transformation of Trinimac into Malacath. It is also for this reason that the et’Ada are no longer. Their actions during the end of the Dawn Era altered every one of them so significantly that they each became Aedra, Daedra, Magne Ge, or Shor. We are unique in an important respect: Nirn, and by extension mortal kind, were built to embody all the known concepts in the universe. The et’Ada all gave parts of themselves, even the Magne Ge left pieces of themselves in the stars, and these define our character to some extent. The Daedra, even though they refused to participate in our creation, also lend their concepts to us on a regular basis. We mortals are not limited to a handful of concepts and exempt from the others. We are able to think freely on all matters, and we are, each and every one of us, a careful interplay of all things in the universe.